In Sydney, there are more fibreglass pool installers than concrete pool builders so there’s more marketing targeted to fibreglass highlighting benefits and concrete comparisons. But how true are the ads? Is a fibreglass pool cheaper? Is it really better to have a slippery surface? Is it really quicker? At Blue Haven Pools we offer unbiased advice because we provide both fibreglass installation and concrete pool builds. In fact, we have been installing fibreglass pools since the 70’s and concrete pools since 1990 so it’s safe to say we know lots about both. Over the last decade we have removed thousands of old fibreglass pool shells and replaced with a new concrete pool structure. Our renovation division has grown by 30% focusing only on this kind of replacement. We’ve seen faded shells, blistered shells, cracks and an overall tiredness to a fibreglass pool shell that looks tacky over time. With a concrete pool you can easily renovate the interior in a decade or two and give it a whole new vibe without a costly removal and replacement of the actual structure. A concrete pool shell is quite adaptable to new fashions and is renovated as often and as easily as you would re colour or remodel a kitchen or bathroom. Concrete pool renovation projects include re-shaping from a large curved structure to a straight lined wall, relaying the coping and relining the interior. The main structure remains the same. Adding a spa. Re-doing an interior to a new vibrant colour. Adding a waterline tile band and changing from a pebble coping to a travertine straight edge. Let’s explore some of the most important things to consider when choosing. Due to manufacturing requirements, fibreglass pools are only offered in certain shapes and sizes meaning they may not fit your home correctly. 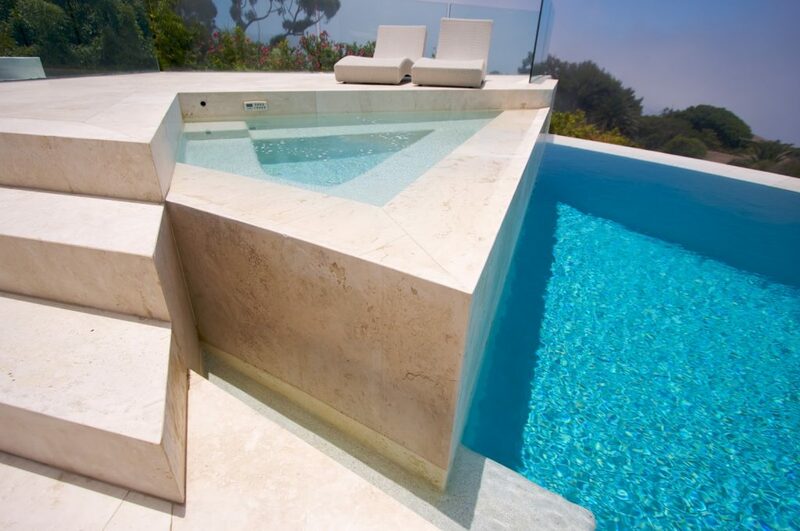 A concrete pool is custom designed to fit your backyard in any shape or size. A fibreglass pool is best suited to a flat level yard. A concrete pool can be built easily on a flat level yard or ideal for a sloping block. An out of ground concrete structure is pretty impressive with drop edge / wet edge tanks; glass panel windows, raised spa and raised feature walls. A fibreglass shell is just that. Its a shell. Then you will need a landscaper or concretor in anyway to instal the bonbeam and any other hard surfaces or retaining walls planned around the pool. With a concrete pool the integration into surrounds and walkways is easily part of the pool build which means one concrete truck, one concrete crew; same day service; saving time and money. Hardscape integration most certainly is easier with a concrete pool builder. Excavation costs for both pool types remain the same. However; Fibreglass costs particularly rise with freight, cranes and traffic control; not to mention the dramatic impact that power lines with tigertail protection costs. These things can add over $10,000 to a project and this is where you need to weigh up the benefits of a custom hand made concrete pool. Some risk shell damage during high wind delivery or very wet site installations. Some shells can be prone to sun or chemical damage leading to discolouring over time. If you’re building a new home and want to take advantage of an open block for access you can save lots of money on machinery. Did you know that if your excavation access is restricted to below 1m that dig costs can increase anywhere from $5,000 to $15,000 or more if you need to dig by hand. This is why most people are planning ahead and putting the pool in before the house slab or boundary fences are installed. So which pool is better to instal and leave in-ground for upto 12 months while you build a new home? A concrete pool can sit as a cured concrete shell for many many many years without water. It can sit uncovered and doesn’t need much attention at all. When it’s time to move into your new home and add the finishing touches to your pool the only thing that needs to happen is the rain water will need to be pumped out. A fibreglass pool cannot sit empty and MUST be filled with water straight away or it will simply pop out of the ground. The water anchors the pool to some degree and must never be empty. This means that your pool will sit with stagnant water, unfiltered for many many months. Imagine the sight and smell and colour when the cover comes off? We’ve seen all kinds of shell discolouration due to intense washing of sludge after being stagnant for a long time. There also the cost to cover up the large body of airborne water while the house is being built so expect another cost of boarding up the pool (void protection) and this adds another $4000 to $6000 for boarding up; removal and disposal of boards. Concrete pools have a long been known for their sturdiness and strength. People opting for concrete pools often do so for peace of mind and lower installation and maintenance costs; but the most obviously advantage is flexibility of design and adaptability to all site conditions. A concrete pool can be built on a rooftop or wrapped around a house. I’ve designed a long pool right up against the dining room windows. Installing your pool doesn’t have to be difficult or scary. 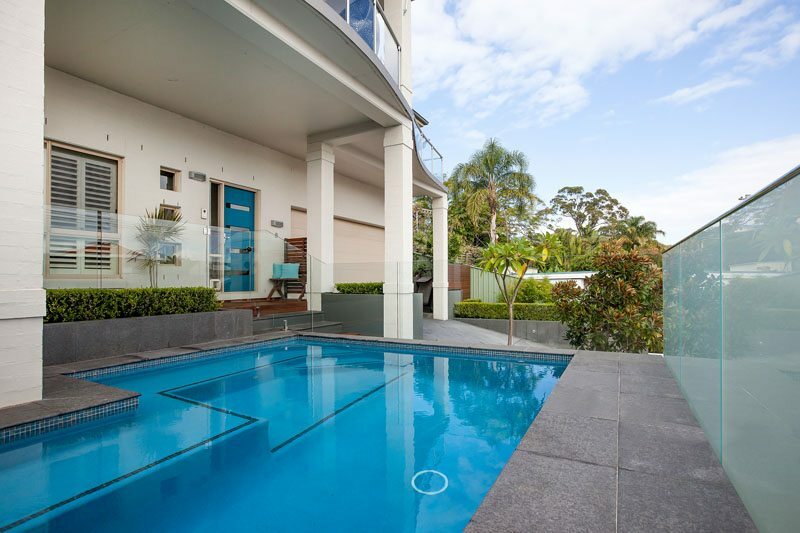 At Blue Haven while we offer both fibreglass and concrete pool options, our concrete pool pricing is far less than any fibreglass pool competitor on the market and we do this without compromising quality. To find out more about how we can help you install the perfect pool, call us on 13 20 25 or upload your house plans and big ideas on our contact page for a free online assessment.